We’ve all had negative thoughts. They may be angry, they may be hurtful, they may be full of doubt—or they just may be stupid. This is a pivotal moment. We have a choice whether or not we’re going to let that thought stay around, whether or not we rehearse that thought over and over, or and whether or not we let that thought start coming out of our mouth. Stupid thoughts will come, but we don’t have to allow them to stay. Here’s what you have to do—cast down imaginations. 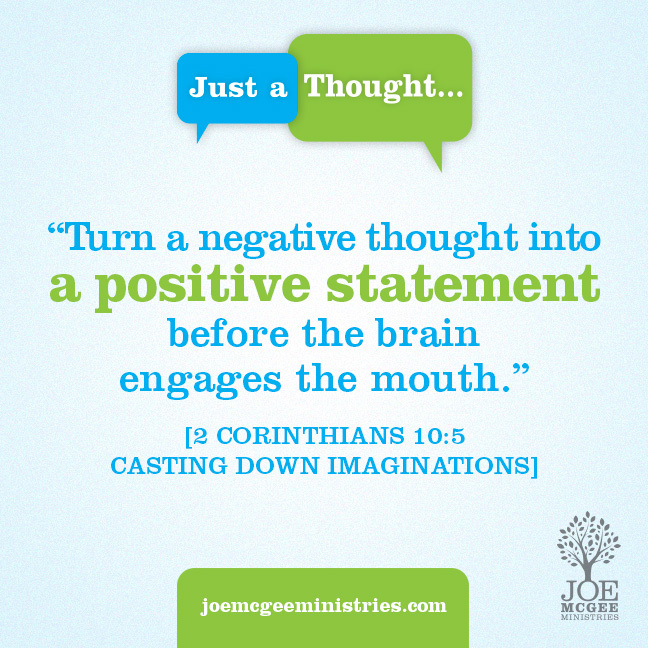 That means, instead of allowing negative thoughts to stay, we need to remind ourselves of what God’s Word says. In order to replace those negative thoughts, we need to speak God’s Word and that means we need to know what God’s Word says. The next time you have a negative thought, stop yourself from talking about whatever problem it’s related to, and instead, say what God’s says!